In an article titled “Tuning and sensitivity of the human vestibular system to low-frequency vibration,”1 three British scientists have demonstrated that the inner ear is “extremely sensitive” to extremely low levels of low frequency noise, indeed “approaching the seismic sensitivity of the frog ear.” They go on to wonder about the “behavioral consequences” of such sensitivity—a degree of sensitivity, they make clear, that is found even in normal human subjects. This is precisely what Nina Pierpont has been talking about. This new research offers substantial support for her claim that a perturbed vestibular apparatus is one of the keys to explaining Wind Turbine Syndrome. “Mechanoreceptive hair-cells of the vertebrate inner ear have a remarkable sensitivity to displacement, whether excited by sound, whole-body acceleration or substrate-borne vibration….In this article we demonstrate for the first time that the human vestibular system [inner ear] is … extremely sensitive to low-frequency and infrasound vibrations.” “Human [inner ear] receptor sensitivity is probably … approaching the seismic sensitivity of the frog ear” (emphasis added, Abstract). “The very low [noise] thresholds we found are remarkable as they suggest that humans possess a frog- or fish-like sensory mechanism which appears to exceed the cochlea for detection of substrate-borne low-frequency vibration and which until now has not been properly recognised…. A fundamental question is also raised as to the possible behavioral consequences … such a mechanism may have” (p. 41). 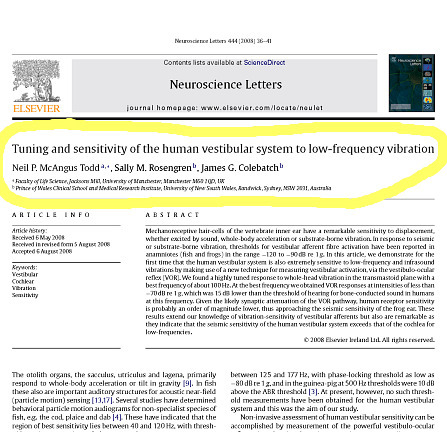 1 Neil P. McAngus Todd, Sally M. Rosengren, James G. Colebatch, “Tuning and sensitivity of the human vestibular system to low-frequency vibration,” Neuroscience Letters 444 (2008):36-41. Aren’t some of the consequences already known??? Haven’t I read about a tool used by military/police for crowd/riot control that sends a blast of low frequency sound at people? They feel sick and debilitated. Editor’s reply. Yes, it’s called The Scream. Click here to read about it. Basically, The Scream produces an exaggerated form of Wind Turbine Syndrome. Alternatively, you might think of wind turbines as mini-versions of The Scream. We ran an article about this in our local newspaper several years ago, pointing out how “The Scream” produces low frequency noise which causes extreme Wind Turbine Syndrome symptoms. This is the letter of ridicule that was soon after posted by Noble Environmental. As you fall under criticism by the American Wind Energy Association, indications are that you are fully credible. You may know that when Chairman of Natural Resources Nick J. Rahall II introduced legislation to assist in the protection of endangered species, the AWEA launched an attack the Chairman called, “hysterical,” as he was attempting to restrict wind turbine development. I very much appreciate your courageous stand taken in the interest of citizens’ and the environment. Let the truth ring, instead of our ears! Editor’s note: Thank you for your kind words. Nina very much appreciates it. Speaking of the Cape Wind project: We contacted the folks fighting the wind turbines there, to let them know that fish and sea mammals may, indeed, experience a version of Wind Turbine Syndrome—once those turbines go in. I know this sounds farfetched, but it has to do with the inner ear structures of balance, and motion and position sense. We share these organs, and their functions, with whales, dolphins, fish, and other marine life. Nina was going to propose to do a research article for them, covering the literature on the subject. Alas, they never replied. If you have any contact with these people, you might let them know there’s a potential issue here. And have them contact us.